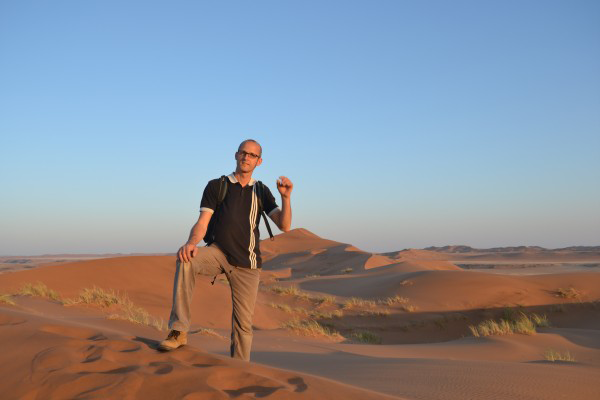 Sebastian Engelstaedter is a trained geologist with a Diplom (equivalent to Masters) degree from the Friedrich-Schiller University Jena (Germany). After working for a agricultural services company in Germany he started a D.Phil. at the School of Geography and the Environment at Oxford studying the role of atmospheric processes in controlling the emission and transport of desert dust. At OUCE Sebastian is responsible for services related to climate computations including the maintenance of the department's climate datasets and assisting researchers in their climate data processing tasks. 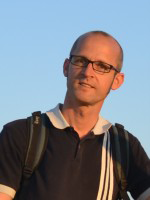 He teaches courses on climate computing and the analysis of large datasets (DTP programme). Sebastian develops web-based applications featuring analysis and plotting capabilities for large climate data sets such as CMIP5 (Coupled Model Inter-comparison Project Phase 5). Dunes at the Namib-Naukluft NP near the Gobabeb Training and Research Centre, Namibia. 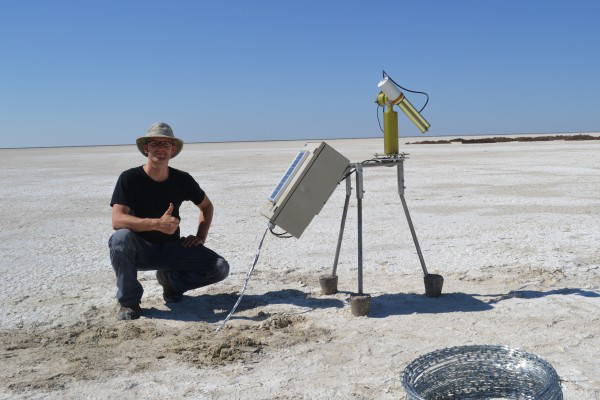 For more than a decade Sebastian has been interested in the processes that link the atmosphere and the surface in desert environments with a focus on the dust cycle (emission, transport and deposition of of mineral dust). Airborne mineral dust plays an important role in the climate system due to its impact on the Earth's radiation budget and its impact on biogeochemical processes in terrestrial and oceanic ecosystems (e.g., iron and phosphate fertilisation). His research combines the analysis of ground-based, airborne and remotely sensed observations and numerical model simulations on regional to global scales. Sebastian has been involved in various projects including DIRTMAP (Dust Indicators and Records of Terrestrial and Marine Palaeoenvironments), BoDEx (Bodele Dust Experiment), AMMA (African Monsoon Multidisciplinary Analyses), Fennec - The Saharan Climate System, DO4Models (Dust Observations for Models) and CLARIFY (CLouds and Aerosol Radiative Impacts and Forcing). Cimel sun photometer on the Etosha Pan, Namibia. 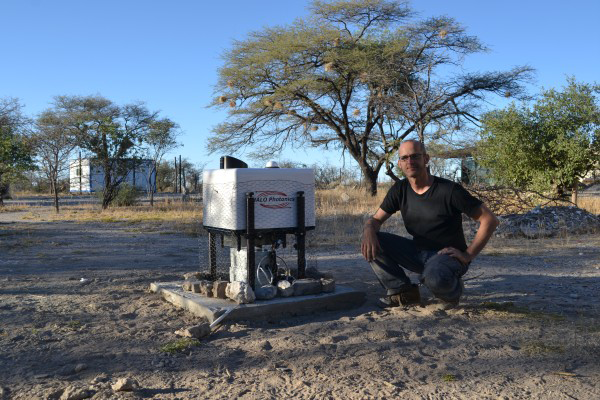 HALO Photonics Stream Line lidar system at the Etosha NP Okaukuejo research camp, Namibia. Engelstaedter, S., Washington, R., Flamant, C., Parker, D.J., Allen, C.J.T. and Todd, M.C. (2015) The Saharan heat low and moisture transport pathways in the central Sahara – multi-aircraft observations and Africa-LAM evaluation. Journal of Geophysical Research: Atmospheres, 120: 4417-4442. Ryder, C.L., McQuaid, J.B., Flamant, C., Washington, R., Brindley, H.E., Highwood, E.J., Marsham, J.H., Parker, D.J., Todd, M.C., Banks, J.R., Brooke, J.K., Engelstaedter, S., Estellés, V., Formenti, P., Garcia-Carreras, L., Kocha, C., Marenco, F., Rosenberg, P., Sodemann, H., Allen, C.J.T., Bourdon, A., Bart, M., Cavazos-Guerra, C., Chevaillier, S., Crosier, J., Darbyshire, E., Dean, A.R., Dorsey, J.R., Kent, J., O'Sullivan, D., Schepanski, K., Szpek, K. and Woolley, A. (2015) Advances in understanding mineral dust and boundary layer processes over the Sahara from Fennec aircraft observations. Atmospheric Chemistry and Physics, 15: 199-290. Allen, C.J.T., Washington, R. and Engelstaedter, S. (2013) Dust emission and transport mechanisms in the central Sahara: Fennec ground-based observations from Bordj Badji Mokhtar, June 2011. Journal of Geophysical Research Atmospheres, 118(12): 6212-6232. Marsham, J.H., Hobby, M., Allen, C.J.T., Banks, J.R., Bart, M., Brooks, B.J., Cavazos-Guerra, C., Engelstaedter, S., Gascoyne, M., Lima, A.R., Martins, J.V., McQuaid, J.B., O'Leary, A., Ouchene, O., Ouladichir, A., Parker, D.J., Saci, A., Salah-Ferroudj, M., Todd, M.C. and Washington, R. (2013) Meteorology and dust in the central Sahara: Observations from Fennec supersite-1 during the June 2011 Intensive Observation Period. Journal of Geophysical Research: Atmospheres, 118. Todd, M.C., Allen, C.J.T., Bart, M., Bechir, M., Bentefouet, J., Brooks, A.B.J., Cavazos-Guerra, C., Clovis, T., Dieh, M.F., Engelstaedter, S., Flamant, C., Garcia-Carreras, L., Gandega, A., Gascoyne, M., Hobby, M., Kocha, C., Lavaysse, C., Marsham, J.H., Martins, J.V., McQuaid, J.B., Ngamini, J.B., Parker, D.J., Podvin, T., Rocha-Lima, A., Traoré, S., Wang, Y. and Washington, R. (2013) Meteorological and dust aerosol conditions over the Western Saharan region observed at Fennec supersite-2 during the Intensive Observation Period in June 2011. Journal of Geophysical Research: Atmospheres, 118(15): 8426-8447. Mahowald, N., Albani, S., Engelstaedter, S., Winckler, G. and Goman, M. (2011) Model insight into glacial–interglacial paleodust records. Quaternary Science Reviews, 30(7-8): 832-854. Mahowald, N.M., Kloster, S., Engelstaedter, S., Moore, J.K., Mukhopadhyay, S., McConnell, J.R., Albani, S., Doney, S.C., Bhattacharya, A., Curran, M.A.J., Flanner, M.G., Hoffman, F.M., Lawrence, D.M., Lindsay, K., Mayewski, P.A., Neff, J., Rothenberg, D., Thomas, E., Thornton, P.E. and Zender, C.S. (2010) Observed 20th century desert dust variability: impact on climate and biogeochemistry. Atmospheric Chemistry and Physics, 10: 12585-12628. Engelstaedter, S., Washington, R. and Mahowald, N. (2009) Impact of changes in atmospheric conditions in modulating summer dust concentration at Barbados: a back-trajectory analysis. Journal of Geophysical Research: Atmospheres, 114(D17111). Mahowald, N.M., Engelstaedter, S., Luo, C., Sealy, A., Artaxo, P., Benitez-Nelson, C., Bonnet, S., Chen, Y., Chuang, P.Y., Cohen, D.D., Dulac, F., Herut, B., Johansen, A.M., Kubilay, N., Losno, R., Maenhaut, W., Paytan, A., Prospero, J.A., Shank, L.M. and Siefert, R.L. (2009) Atmospheric iron deposition: global distribution, variability and human perturbations. Annual Review of Marine Science, 1: 245-278. Washington, R., Bouet, C., Cautenet, G., Mackenzie, E., Ashpole, I., Engelstaedter, S., Lizcano, G., Henderson, G.M., Schepanski, K. and Tegen, I. (2009) Dust as a tipping element: the Bodélé Depression, Chad. Proceedings of the National Academy of Sciences, 106(49): 20564-20571. Engelstaedter, S. and Washington, R. (2008) Reply to comment by E. Williams on 'Atmospheric controls on the annual cycle of North African dust'. Journal of Geophysical Research, 113(D23110). Engelstaedter, S. and Washington, R. (2007) Atmospheric controls on the annual cycle of North African dust. Journal of Geophysical Research: Atmospheres, 112. D03103. Engelstaedter, S. and Washington, R. (2007) Temporal controls on global dust emissions: the role of surface gustiness. Geophysical Research Letters, 34(L15805). Todd, M.C., Washington, R., Martins, J.V., Dubovik, O., Lizcano, G., M'Bainayel, S. and Engelstaedter, S. (2007) Mineral dust emission from the Bodélé Depression, northern Chad, during BoDex 2005. Journal of Geophysical Research, 112(D06207). Warren, A., Chappell, A., Todd, M.C., Bristow, C., Drake, N., Engelstaedter, S., Martins, V., M'bainayel, S. and Washington, R. (2007) Dust-raising in the dustiest place on earth. Geomorphology, 92(1-2): 25-37. Engelstaedter, S., Tegen, I. and Washington, R. (2006) North African dust emissions and transport. Earth-Science Reviews, 79(1-2): 73-100. Washington, R., Todd, M.C., Engelstaedter, S., Mbainayel, S. and Mitchell, F. (2006) Dust and the low-level circulation over the Bodélé Depression, Chad: observations from BoDex 2005. Journal of Geophysical Research, 111(D03201). Washington, R., Todd, M.C., Lizcano, G., Tegen, I., Flamant, C., Koren, I., Ginoux, P., Engelstaedter, S., Bristow, C.S., Zender, C.S., Goudie, A.S., Warren, A. and Prospero, J.M. (2006) Links between topography, wind, deflation, lakes and dust: the case of the Bodélé Depression, Chad. Geophysical Research Letters, 33(L09401). Engelstaedter, S., Kohfeld, K.E., Tegen, I. and Harrison, S.P. (2003) Controls of dust emissions by vegetation and topographic depressions: An evaluation using dust storm frequency data. Geophysical Research Letters, 30(1294). Tegen, I., Harrison, S.P., Kohfeld, K.E., Engelstaedter, S. and Werner, M. (2002) Emission of soil dust aerosol: Anthropogenic contribution and future changes. Geochimica Et Cosmochimica Acta, 66(A766). Engelstaedter, S., Washington, R., Flamant, C., Parker, D.J., Allen, C.J.T., and Todd, M.C., (2015) The Saharan heat low and moisture transport pathways in the central Sahara - multi-aircraft observations and Africa-LAM evaluation. Journal of Geophysical Research: Atmospheres, 120: 4417-4442. Ryder, C.L., McQuaid, J.B., Flamant, C., Rosenberg, P.D., Washington, R., Brindley, H.E., Highwood, E.J., Marsham, J.H., Parker, D.J., Todd, M.C., Banks, J.R., Brooke, J.K., Engelstaedter, S., Estelles, V., Formenti, P., Garcia-Carreras, L., Kocha, C., Marenco, F., Sodemann, H., Allen, C.J.T., Bourdon, A., Bart, M., Cavazos-Guerra, C., Chevaillier, S., Crosier, J., Darbyshire, E., Dean, A.R., Dorsey, J.R., Kent, J., O'Sullivan, D., Schepanski, K., Szpek, K., Trembath, J., Woolley, A., (2015) Advances in understanding mineral dust and boundary layer processes over the Sahara from Fennec aircraft observations. Atmospheric Chemistry and Physics, 15: 199-290. Allen, C.J.T., Washington, R., and Engelstaedter, S. (2013) Dust emission and transport mechanisms in the central Sahara: Fennec ground-based observations from Bordj Badji Mokhtar, June 2011. Journal of Geophysical Research: Atmospheres, 118: 6212-6232. Hobby, M., Gascoyne, M., Marsham, J.H., Bart, M., Allen, C., Engelstaedter, S., Fadel, D.M., Gandega, A., Lane, R., McQuaid, J.B., Ouchene, B., Ouladichir, A., Parker, D.J., Rosenberg, P., Ferroudj, M.S., Saci, A., Seddik, F., Todd, M., Walker, D., and Washington, R. (2013) The Fennec Automatic Weather Station (AWS) Network: Monitoring the Saharan Climate System. Journal of Atmospheric and Oceanic Technology, 30: 709-724. Marsham, J.H., Hobby, M., Allen, C.J.T., Banks, J.R., Bart, M., Brooks, B.J., Cavazos-Guerra, C., Engelstaedter, S., Gascoyne, M., Lima, A.R., Martins, J.V., McQuaid, J.B., O'Leary, A., Ouchene, B., Ouladichir, A., Parker, D.J., Saci, A., Salah-Ferroudj, M., Todd, M.C., and Washington, R. (2013) Meteorology and dust in the central Sahara: Observations from Fennec supersite-1 during the June 2011 Intensive Observation Period. Journal of Geophysical Research: Atmospheres, 118: 4069-4089. Todd, M.C., Allen, C.J.T., Bart, M., Bechir, M., Bentefouet, J., Brooks, B.J., Cavazos-Guerra, C., Clovis, T., Deyane, S., Dieh, M., Engelstaedter, S., Flamant, C., Garcia-Carreras, L., Gandega, A., Gascoyne, M., Hobby, M., Kocha, C., Lavaysse, C., Marsham, J.H., Martins, J.V., McQuaid, J.B., Ngamini, J.B., Parker, D.J., Podvin, T., Rocha-Lima, A., Traore, S., Wang, Y. and Washington, R. (2013) Meteorological and dust aerosol conditions over the western Saharan region observed at Fennec Supersite-2 during the intensive observation period in June 2011. Journal of Geophysical Research: Atmospheres, 118: 8426-8447. Mahowald, N., Albani, S., Engelstaedter, S., Winckler, G., and Goman, M. (2011) Model insight into glacial-interglacial paleodust records. Quaternary Science Reviews, 30: 832-854. Mahowald, N.M., Kloster, S., Engelstaedter, S., Moore, J.K., Mukhopadhyay, S., McConnell, J.R., Albani, S., Doney, S.C., Bhattacharya, A., Curran, M.A.J., Flanner, M.G., Hoffman, F.M., Lawrence, D.M., Lindsay, K., Mayewski, P.A., Neff, J., Rothenberg, D., Thomas, E., Thornton, P.E. and Zender, C.S. (2010) Observed 20th century desert dust variability: impact on climate and biogeochemistry. Atmospheric Chemistry and Physics, 10: 10875-10893. Engelstaedter, S., Washington, R. and Mahowald, N.M. (2009) The impact of changes in atmospheric conditions in modulating summer dust concentration at Barbados: a back-trajectory analysis. Journal of Geophysical Research: Atmospheres, 114: D17111. Mahowald, N.M., Engelstaedter, S., Luo, C., Sealy, A., Artaxo, P., Benitez-Nelson, C., Bonnet, S., Chen, Y., Chuang, P.Y., Cohen, D.D., Dulac, F., Herut, B., Johansen, A.M., Kubilay, N., Losno, R., Maenhaut, W., Paytan, A., Prospero, J.A., Shank, L.M. and Siefert, R.L. (2009) Atmospheric iron deposition: global distribution, variability, and human perturbations. Annual Review of Marine Science, 1: 245-278. Washington, R., Bouet, C., Cautenet, G., Mackenzie, E., Ashpole, I., Engelstaedter, S., Lizcano, G., Henderson, G.M., Schepanski, K., and Tegen, I. (2009) Dust as a tipping element: The Bodélé Depression, Chad. Proceedings of the National Academy of Sciences of the United States of America, 106: 20564-20571. Engelstaedter, S. and Washington, R. (2008) Reply to comment by E. Williams on 'Atmospheric controls on the annual cycle of North African dust'. Journal of Geophysical Research: Atmospheres, 113: D23110. Engelstaedter, S. and Washington, R. (2007) Atmospheric controls on the annual cycle of North African dust. Journal of Geophysical Research: Atmospheres, 112: D03103. Engelstaedter, S. and Washington, R. (2007b) Temporal controls on global dust emissions: The role of surface gustiness. Geophysical Research Letters, 34: L15805. Todd, M.C., Washington, R., Martins, J.V., Dubovik, O., Lizcano, G., M'Bainayel, S. and Engelstaedter, S. (2007) Mineral dust emission from the Bodélé Depression, northern Chad, during BoDEx 2005. Journal of Geophysical Research: Atmospheres, 112: D06207. Warren, A., Chappell, A., Todd, M.C., Bristow, C., Drake, N., Engelstaedter, S., Martins, V., M'bainayel, S. and Washington, R. (2007) Dust-raising in the dustiest place on earth. Geomorphology, 92: 25-37. Engelstaedter, S., Tegen, I. and Washington, R. (2006) North African dust emissions and transport. Earth-Science Reviews, 79: 73-100. Washington, R., Todd, M.C., Engelstaedter, S., Mbainayel, S. and Mitchell, F. (2006) Dust and the low-level circulation over the Bodélé Depression, Chad: Observations from BoDEx 2005. Journal of Geophysical Research: Atmospheres, 111: D03201. Washington, R., Todd, M.C., Lizcano, G., Tegen, I., Flamant, C., Koren, I., Ginoux, P., Engelstaedter, S., Bristow, C.S., Zender, C.S., Goudie, A.S., Warren, A. and Prospero, J.M. (2006b) Links between topography, wind, deflation, lakes and dust: The case of the Bodélé Depression, Chad. Geophysical Research Letters, 33: L09401. Engelstaedter, S., Kohfeld, K.E., Tegen, I. and Harrison, S.P. (2003) Controls of dust emissions by vegetation and topographic depressions: An evaluation using dust storm frequency data. Geophysical Research Letters, 30: 1294. Tegen, I., Harrison, S.P., Kohfeld, K.E., Engelstaedter, S. and Werner, M. (2002) Emission of soil dust aerosol: Anthropogenic contribution and future changes. Geochimica Et Cosmochimica Acta, 66: A766.